Add these sunflower accessories to your kitchen to create a bright and cheerful room. I live in Maine and know how hard winter can be. Every spring I look forward to opening the windows and letting in the sun and warm ocean breeze. It's also the time when I put away my winter kitchen accessories and bring out the sunflowers. These lift my spirit as I wait for my garden to bloom. Sometimes just switching out my kitchen towels for the bright and happy sunflower towels or putting bright yellow sunflower placemats out, reassures me that spring and summer are definitely on the way. As the summer warms up and the barbecue season begins, sunflower napkins and paper plates are my favorite place settings. Pretty but easy on the cleanup. Getting rid of the winter doldrums can't get any easier, than switching out kitchen placements. Enjoying your morning coffee, while looking at a sunflower placemat is a great way to start your day. I think that monogrammed placemats are a very sophisticated touch. When you have friends over for a barbecue or summer dinner, the first option creates a very pulled-together look. It's for sale on Zazzle and it's super easy to add your own initials. They also make fabulous housewarming gifts or wedding shower gifts. A couple can never have too many placements or kitchen decor options. You don't have to worry about duplicates. I also love the way sunflowers look blowing in the wind. They are large and dramatic flowers and can take on many different looks. The second option shows single sunflower against a blue background. These placemats look especially nice with white, yellow or green dinner sets. Colorful Sunflower Placemats 20" x 14"
Personalize It to Make It Special! Bright yellow is one of my favorite colors. However, it's a bit much to paint an entire wall that color. I love to have kitchen towels all over the place. I think they are pretty and I'm pretty much a klutz. Therefore, I appreciate how useful and functional they are. As far as I'm concerned blue gingham and yellow sunflowers are the perfect combination. 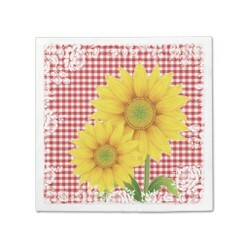 If you've got a traditional home filled with country decor, this sunflower placemat will fit right in. You can even customize it with a name. It's for sale on Zazzle and all you have to do is time the name or the message you want to include. Super easy. How many times have you struggled to find the perfect gift for your favorite aunt or co-worker? Personalizing a pretty and useful kitchen towel or hand towel, is an easy way to solve this gift-giving. It lets the person know that you thought about their gift. With the Zazzle personalization system, it even works for people with unusual names. There is never anything in the gift shop, with "Digby" on it! I always have paper napkins in a holder on the kitchen table. That way if my husband decides to grab a sandwich or brownie, he might possible use a napkin and not leave crumbs all over the house. It looks pretty to have a bright sunflower on the table. I can only hope that the bright yellow color catches his eye and he remembers to use one! I love the simple sunflower napkins that show a single bright yellow sunflower on a white background. They go with all of my plates tableware and makes a bold floral statement. I also love using them when we eat outside at the picnic table. I can opt to use my bright yellow plastic plates or my black china. The basic sunflower napkins go with either of them. However, my mom always uses red plates and has lots of classic red KitchenAid appliances. I can't remember the last time that she changed up her kitchen decor. So I found these pretty sunflower and red check napkins with just the perfect hint of lace. They look perfect in her Maine country kitchen. She doesn't have any other sunflower decor in her kitchen. So this is her only splash of yellow. Finding just the right host gift can be difficult. I know I hate to show up for a vacation empty handed. If the people you're visiting are gardeners or have sunflower decor in their kitchen, then a personalized sunflower cutting board is a useful and unique host gift. This attractive sunflower cutting board is made from non-porous, high-quality tempered glass. It has four rubber feet to keep it securely in place while it is being used. It is paddle-shaped and is 4.75 inches wide and 12.75 inches long. Perfect for slicing vegetables. It also looks beautiful when it is leaned against a backsplash. The Zazzle designer created a simple process for you to use to customize it. There's a space where you enter the name you want displayed on the sunflower cuttingboard. In just a few seconds, you have created a thoughtful and unique host gift. This could also be a very attractive housewarming gift. This is a nice selection. I've planted some sunflowers in my garden this year. I can't wait until they begin to bloom. You've chosen some beautiful sunflower themes here. I love the yellow sunflowers on blue gingham. Hi happynutritionist. I'm glad you like Maine. Yes, a typical winter is long here. Especially in the northern part where I live, but this winter was HORRIBLE. I'm about 5 feet tall and the snow was deeper than me for most of the winter. I agree that Sunflowers will brighten any room and you have displayed them so nicely here. Also, we love your State of Maine and were just there again last September to vacation. I used to want to live there, but the winters are long enough here in NJ, I am sure they would be even longer in Maine. Still, we love it there! That's good news. I still have to plant mine. We've had such a cold and snowy spring, I haven't dared start yet. You're right, gingham works well with sunflowers :). I love sunflowers too. I now have some peeping through the earth in a flower pot on my balcony. Sunflower Shower Curtains bring a cheerful golden glow to your bathroom decor at affordable prices. Change your bathroom decor with this one simple touch!